Miracle Treat Day 2018 is Almost Over! – Dairy Queen Corp. 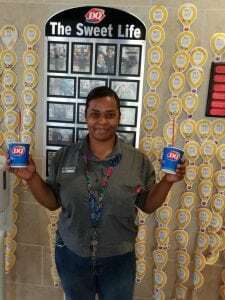 Miracle Treat Day 2018 is Almost Over! Thanks to our friends at Dairy Queen Gretna and Dairy Queen of Slidell, we’re having a great #MiracleTreatDay! Remember, you can support your local Children’s Miracle Network Hospitals until 9 p.m.! Next post: Miracle Treat Day Success!